USC Coordinators are volunteer leadership positions held by undergraduate students. Coordinators work to engage students in meaningful extracurricular pursuits, while supporting the programming interests and advocacy platforms of the USC Executive. As resource providers, service programmers, event planners, social educators, policy writers and creative designers, Coordinators contribute immensely to the overall student experience at Western. In the Advocacy portfolio you will work closely with the USC Vice President on advocacy initiatives at here on campus as well as in the London Community. Become a student advocacy leader and ensure every voice on campus is heard. In this role, you will run campaigns that encourage student engagement in order to give them a space to communicate their opinions, concerns, and questions. This will include running student appeals, academic discussion cafes, and bringing these issues forward to all levels of Canadian government. This role responsible for the administration, organization and promotion of student awards, as well as the selections process. She works with other campus stakeholders to host an annual awards ceremony. In addition to this, she is responsible for recognizing student achievement throughout the entire academic year and facilitating student oriented campaigns. The people who make up the Western community are all incredibly diverse individuals with different perspectives, experiences, wants, and needs. There is room for everyone on this campus, regardless of their gender, age, sexuality, religion, ability or race. The USC fully acknowledges, however, that there are barriers on our campus that prevent an equal opportunity for all in some circumstances. If you would like to assist in removing those barriers and ensuring that all the diverse voices of Western are represented and considered in every decision the USC makes, get involved in the Inclusivity Portfolio and help celebrate uniqueness and individuality. Encourage diversity and ensure that all students have the proper tools to respect and support each other’s identities. In this role, you will coordinate training and programming for students and faculty who wish to be an Ally to those who face or discuss queer issues. You will celebrate campus diversity and oversee educational workshops on things like LGBTQ+ issues, gender identities, cultural competency, and mental health issues in collaboration with the Peer Support Centre. The Western community is a place where diversity should be celebrated in all its forms. In this role, you will address issues on campus concerning culture and/or ethnicity and aim to enhance multiculturalism on campus through representation at the USC’s International Week. You will also conduct research to analyze the issues concerning race and culture that students on campus face and work with the USC to break down these barriers. Make the Western campus a place where everyone feels equally comfortable to be who they are. In this role, you will coordinate a variety of campaigns and educational resources promoting the acceptance of all students on campus, regardless of sexuality or gender identity. You will also work directly with executive members of the USC to ensure that all of our policies, procedures, promotions, and public statements promote messages that are inclusive and celebrate diversity. Show the Western campus that gender really is just a social construct that should not limit who you are or what you can achieve. In this role, you will coordinate educational resources and programming that promotes gender equality and creates safe and health relationships for those who identify as women. You will liaise with other campus groups and organizations in London to create shared advocacy initiatives and programs to ensure that Western a welcome place for all. Help make Western a more accessible place for all of its students. In this role, you will plan events or campaigns throughout the year to raise awareness about accessibility on campus and the challenges faced by students with disabilities. You will also be able to enact positive change by examining the USC’s policies or procedures to ensure all of them support students of any (hidden or observed) ability. Take part in the planning of the USC’s biggest formal event of the year. In this role, you will work with the Student Programs Officer to oversee the planning of Charity Ball and the selection process of the annual partner charity. You also have the opportunity to collaborate with other USC departments: the Productions Department to design, plan, and execute the event, and the Promotions Department to create and advertise the annual Charity Ball Look Book. 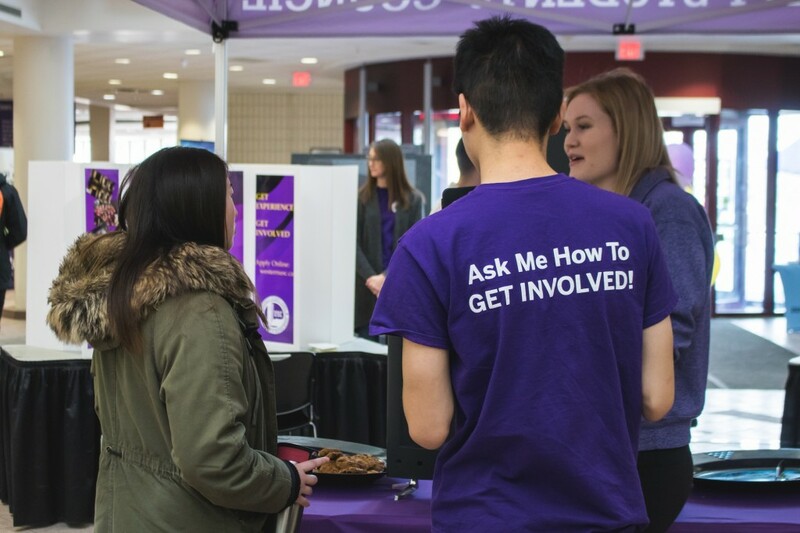 Create professional relationships with various local and global charitable organizations to support student volunteerism opportunities on campus. In this role, you will have the opportunity to help students discover their passion for giving back to a cause they care for. You will also plan and facilitate charity events throughout the year, such as a Halloween event, a Holiday event, Dine in the Dark, and Relay for Life. Support students in their extracurricular involvements on campus. In this role, you will act as a resource to all club presidents and vice presidents. You will also work collaboratively with the Clubs Associate to maintain the administrative tasks involved with managing the clubs system so that all students involved are supported, educated, and celebrated. Create a positive and supportive environment for the student leaders on Western’s campus involved in the clubs community. In this role, you will oversee the development, review, and enforcement of all policies related to the clubs community. You will also work with the Clubs Governance Committee to bring students’ great ideas to life and ratify new clubs each year. Promote the broad spectrum post-secondary opportunities to youth in the London community to help them discover their passions. In this role, you will act as the Program Director for the USC’s Early Outreach Leadership Conference – a weekend-long conference on both the Western and Fanshawe campuses aimed at students who may believe that post-secondary education is beyond their reach. You will establish professional relationship with community partners, assist in the selection and training of student volunteers, and execute all programming initiatives. Educate the Western community on how to become more environmentally conscious. In this role, you will address environmental issues, increase recycling rates on campus, and act as a liaison between the USC and the USC’s Green Plan. You will organize environmentally-related programming and consult with other campus groups to ensure their programming is as environmentally friendly and sustainable as possible. Students should have to focus on being a student, not being hungry. In this role, you will work to reduce hunger on campus by providing quality and accessible food to students through the USC’s Food Bank. In addition to managing the Food Bank system and various Food Drives, you will also have the opportunity to educate students on food instability and and other hunger-related issues. Ensure that the Western student body is well informed about all aspects of health and safety. In this role, you will educate students on health and safety issues, advocate for Wellness services offered on campus, and organize campaigns to break down the stigma associated with health issues that affect students. You will also become a student leader who can create an environment that supports survivors of sexual violence and educate the student body on issues surround sexual violence on campus. Try your hand at the financial game and orchestrate the annual USC income tax clinic. In this role, you will select and manage a group of student volunteers and organize training sessions in conjunction with the Canada Customs and Revenue Agency. You will ensure the clinic itself runs smoothly, maintain the confidentiality of all communications surrounding the clinic, and help breakdown the fear and stress students have around filing their taxes. Bring the joy and sparkle of Broadway to the Western stage. In this role, you will facilitate the annual theatre production, a festival of student-written short plays, and a musical production. You will have the opportunity to oversee everything from the selection of props, to casting, to set and costume design, and the coordinator of the crew members. You’ll also help bring actors and stars to life by coordinating workshops and professional development opportunities in the field. The USC is a fundamentally democratic organization. Each year, you have the power to elect student representatives who will advocate for you and your peers on and off the Western campus. In the Elections portfolio, you will be able to have a direct impact on how the elections process is orchestrated and the ability to ensure that it remains a fair, enjoyable, and fully democratic system. It’s also a great way to gain some first-hand information about how the USC operates as a government body. Your love of politics will flourish in this elections management position. In this role, you will act as the highest governing administrative figure in the USC elections, supporting the Elections Committee in the execution of Fall and Spring elections. You will also be the chair of the Elections Governance Committee, develop relevant training on the elections process, establish guidelines for debates, and ensure that USC bylaws are followed by all candidates. Work collaboratively with the Chief Returning Officer and the Secretary/Treasurer to facilitate the Fall and Spring USC Elections. In this role, you will gain a thorough understanding of the USC’s policies and procedures by frequently assisting with the development of new training materials, recruiting committee members, and acting as a spokesperson when the Chief Returning Officer is unavailable. Work with the Communications Officer to develop the USC’s brand and establish a consistent image across all promotional campaigns. In this role, you will assist with the planning and promotion of any USC public campaigns, building social media strategies and creating Facebook events and other social media posts when necessary. Put your design skills to use and develop a consistent image for the USC’s brand. In this role, you will have the opportunity develop an artistic vision for the USC and produce various mediums of promotional material, as well as assisting with any web design or social media projects. You will transform USC documents into aesthetically appealing reports that will be distributed online and to the community at large. Put on your PR hat and work alongside the USC’s executive staff and administration to create great public relations campaigns. In this role, you will have the opportunity to learn what it’s like to work in the ever-growing public relations field by building relationships with campus and local media outlets. You will create media campaigns to support USC programming and may act as a spokesperson to USC partners when requested. Make sure the USC remains an institution that is mandated by students for students by listening to students’ questions, concerns, and suggestions. In this role, you will work with the Communications Officer to gather feedback from the student population to help better plan USC activities. This will be done through both online polling or surveys through social media, or in person through leading town halls or meeting with Faculty and Affiliate Councils. Be purple and proud and make sure everyone on campus knows it. In this role, you will be at the centre of the USC’s student engagement initiative. Acting as the real-life version of Facebook notifications, you will lead a team of student volunteers to spread the USC’s message across campus. Working closely with the Communications Officer, you will have the opportunity to gather student feedback to use in future promotional campaigns. The USC offers hundreds of paid and volunteer positions for students at Western. These can include internships with business managers, working closely with the student executive, and volunteering on one of the many programming or service files. The core of the USC will always be student leadership and decision-making.